Errol Flynn was one of the most famous character actors from our shores that made good in Hollywood golden being known for many heroic films in his era but died young. The many stories of himself as to being classed as a real mans man’, as he was known for adventure and with his good looks and charm he had the reputation of being a wicked heartbreaker, who lived life hard with drinking and drugs. In like Flynn is a film adaption of his early life before he hits fame as a actor. He plays is a guide for a Hollywood producer in the jungles of Papua New Guinea, where the young Flynn discovers a trail that will lead to a fortune in gold. We are in Depression-era Sydney, he recruits a motley group of fellow opportunists with whom he sets sail in a yacht stolen from Chinese opium smugglers. What follows is a mythical and satirical coming-of-age story about four men on a journey to find hope, adventure and fortune at a time when the world was spiralling into despair. The film was shot in Queensland’s Gold Coast hinterland, and Thomas Cocquerel who plays Flynn looks great up on screen along with his with co-stars Corey Large, William Mosely, Isabel Lucas, David Wenham, with Dan Fogler and Clive Stande. From start to finish the film was a bit of a mess and leaves you feeling a bit confused. Hard to engage with this film, its just rowdy men mainly lots of reckless story lines and what a shame as if only it could of been thought out more. It was directed by Russell Mulcahy (Highlander 1 & 2, Resident Evil: Extinction, Teen Wolf) Some of the cinema shots are worked well in the film but does not save it. Nothing else to say unfortunately. 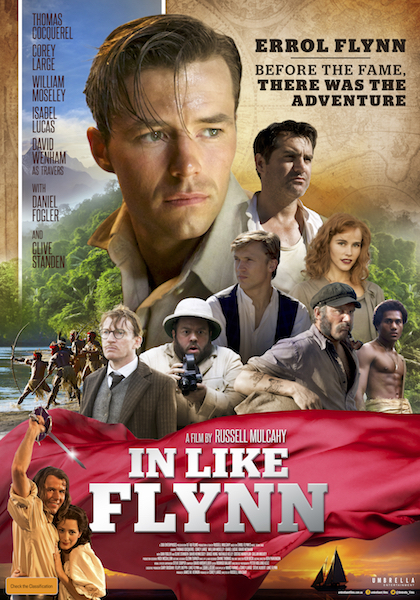 IN LIKE FLYNN across cinemas nationally on 11 October 2018.